Definition at line 36 of file face-status.hpp. Definition at line 34 of file face-status.cpp. Definition at line 46 of file face-status.cpp. Definition at line 53 of file face-status.cpp. References ndn::tlv::nfd::BaseCongestionMarkingInterval, ndn::tlv::nfd::DefaultCongestionThreshold, ndn::tlv::nfd::ExpirationPeriod, ndn::tlv::nfd::FaceId, ndn::tlv::nfd::FacePersistency, ndn::tlv::nfd::FaceScope, ndn::tlv::nfd::FaceStatus, ndn::tlv::nfd::Flags, ndn::tlv::nfd::LinkType, ndn::tlv::nfd::LocalUri, ndn::nfd::FaceTraits< FaceStatus >::m_faceId, ndn::nfd::FaceTraits< FaceStatus >::m_facePersistency, ndn::nfd::FaceTraits< FaceStatus >::m_faceScope, ndn::nfd::FaceTraits< FaceStatus >::m_flags, ndn::nfd::FaceTraits< FaceStatus >::m_linkType, ndn::nfd::FaceTraits< FaceStatus >::m_localUri, ndn::nfd::FaceTraits< FaceStatus >::m_remoteUri, ndn::tlv::nfd::Mtu, ndn::tlv::nfd::NInBytes, ndn::tlv::nfd::NInData, ndn::tlv::nfd::NInInterests, ndn::tlv::nfd::NInNacks, ndn::tlv::nfd::NOutBytes, ndn::tlv::nfd::NOutData, ndn::tlv::nfd::NOutInterests, ndn::tlv::nfd::NOutNacks, ndn::encoding::prependNonNegativeIntegerBlock(), ndn::encoding::prependStringBlock(), and ndn::tlv::nfd::Uri. Definition at line 96 of file face-status.cpp. References ndn::Block::hasWire(), and ndn::nfd::FaceTraits< FaceStatus >::m_wire. Definition at line 112 of file face-status.cpp. References ndn::tlv::nfd::BaseCongestionMarkingInterval, ndn::tlv::nfd::DefaultCongestionThreshold, ndn::Block::elements_begin(), ndn::Block::elements_end(), ndn::tlv::nfd::ExpirationPeriod, ndn::tlv::nfd::FaceId, ndn::tlv::nfd::FacePersistency, ndn::tlv::nfd::FaceScope, ndn::tlv::nfd::FaceStatus, ndn::tlv::nfd::Flags, ndn::tlv::nfd::LinkType, ndn::tlv::nfd::LocalUri, ndn::nfd::FaceTraits< FaceStatus >::m_faceId, ndn::nfd::FaceTraits< FaceStatus >::m_facePersistency, ndn::nfd::FaceTraits< FaceStatus >::m_faceScope, ndn::nfd::FaceTraits< FaceStatus >::m_flags, ndn::nfd::FaceTraits< FaceStatus >::m_linkType, ndn::nfd::FaceTraits< FaceStatus >::m_localUri, ndn::nfd::FaceTraits< FaceStatus >::m_remoteUri, ndn::nfd::FaceTraits< FaceStatus >::m_wire, ndn::tlv::nfd::Mtu, ndn::tlv::nfd::NInBytes, ndn::tlv::nfd::NInData, ndn::tlv::nfd::NInInterests, ndn::tlv::nfd::NInNacks, ndn::tlv::nfd::NOutBytes, ndn::tlv::nfd::NOutData, ndn::tlv::nfd::NOutInterests, ndn::tlv::nfd::NOutNacks, nonstd::optional_lite::nullopt, ndn::Block::parse(), ndn::encoding::readNonNegativeInteger(), ndn::encoding::readString(), ndn::Block::type(), and ndn::tlv::nfd::Uri. Definition at line 62 of file face-status.hpp. Referenced by getExpirationPeriod(), ndn::nfd::operator<<(), and ndn::nfd::operator==(). Definition at line 68 of file face-status.hpp. Definition at line 275 of file face-status.cpp. 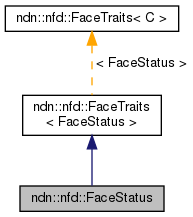 References ndn::nfd::FaceTraits< FaceStatus >::m_wire, and ndn::Block::reset(). Definition at line 283 of file face-status.cpp. References ndn::nfd::FaceTraits< FaceStatus >::m_wire, nonstd::optional_lite::nullopt, and ndn::Block::reset(). Definition at line 81 of file face-status.hpp. Referenced by getBaseCongestionMarkingInterval(), ndn::nfd::operator<<(), and ndn::nfd::operator==(). Definition at line 87 of file face-status.hpp. Definition at line 291 of file face-status.cpp. Definition at line 299 of file face-status.cpp. Definition at line 100 of file face-status.hpp. Referenced by getDefaultCongestionThreshold(), ndn::nfd::operator<<(), and ndn::nfd::operator==(). Definition at line 108 of file face-status.hpp. Definition at line 307 of file face-status.cpp. Definition at line 315 of file face-status.cpp. Definition at line 123 of file face-status.hpp. Referenced by getMtu(), ndn::nfd::operator<<(), and ndn::nfd::operator==(). Definition at line 133 of file face-status.hpp. Definition at line 323 of file face-status.cpp. Definition at line 331 of file face-status.cpp. Definition at line 150 of file face-status.hpp. Definition at line 339 of file face-status.cpp. Definition at line 159 of file face-status.hpp. Definition at line 347 of file face-status.cpp. Definition at line 168 of file face-status.hpp. Definition at line 355 of file face-status.cpp. Definition at line 177 of file face-status.hpp. Definition at line 363 of file face-status.cpp. Definition at line 186 of file face-status.hpp. Definition at line 371 of file face-status.cpp. Definition at line 195 of file face-status.hpp. Definition at line 379 of file face-status.cpp. Definition at line 204 of file face-status.hpp. Definition at line 387 of file face-status.cpp. Definition at line 213 of file face-status.hpp. Definition at line 395 of file face-status.cpp.